Chances are, you and your family will be hitting the road at some point this summer for the annual vacation. And if you’ve got a little one in tow who’s not yet sleeping in a bed, you know what a fuss it can be to give them a comfortable place to rest their weary head. 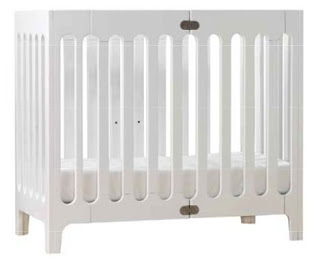 When a Pack ‘n Play just won’t do, the Alma Urban Cot/Crib by Bloom is the way to go for posh tots. This wooden folding crib doesn’t require any tools for assembly and stows away easily. Because of its sleek design, it’s also a practical, year-round choice for urban living where space can be tight. Don’t relegate this crib to the attic for overnights to Grandma’s; its $400 pricetag can be a bit steep for the thrifty shopper. But if you’re one for style and making your baby’s furnishings blend in with the rest of your home decor, this is one model to proudly showcase. Alma is available in coconut white or gala green. It’s available in Giggle stores . In a Nutshell: Fashion and functionality come at a price, but this crib is one worth shelling out the extra bucks for.